A raw inspired snack that’s packed with healthy natural goodness. 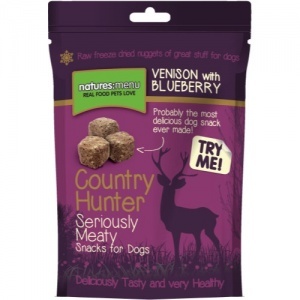 Delicious freeze dried raw meaty nuggets of ethically sourced Venison and superfoods. Single protein. Grain Free. Low fat. Nature's Menu only use quality, human grade meats in natural pet foods, and absolutely no meat meals or meat derivatives. All of their complete and balanced meals are veterinary approved and made to FEDIAF guidelines.